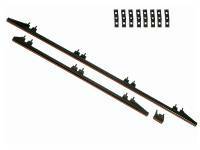 his factory-style replacement grill and headlamp bezel set is manufactured in ABS plastic as original and features the correct contours and mounting points. Reproduction grill for 1971 Barracuda and 'Cuda models. 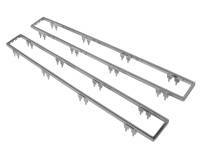 Features correct contours, mounting points, and includes all the stainless trim as well as the headlamp bezels. 1970 Challenger Grille. Does Not Include the Headlight Bezels. 1970 Cuda Black Headlight Buckets with the Brass Inserts in the Mounting Feet, the Same as the Originals. Set of 2. 1971 Cuda Headlight Bezels Black. 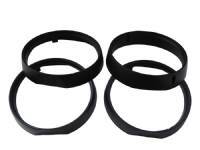 Plastic Headlight Rings. Sold as a Set. 1971 Cuda Headlight Bezels Chrome. 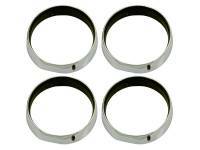 Plastic Chromed Headlight Rings. Sold as a Set. 1972-74 Cuda Front Grill Trim. 72-74 Cuda New reproduction grille, made just like the original and painted argent. 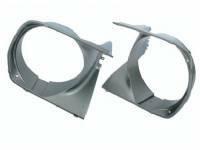 1972-74 Cuda Headlight Bezels. Sold as a Pair.